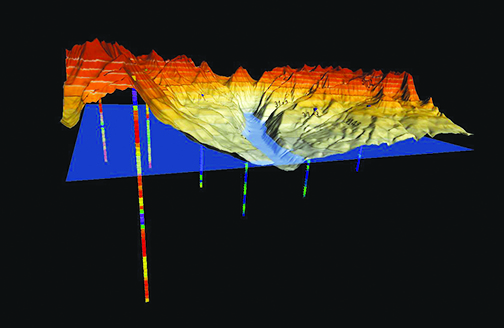 Golden Software, a developer of affordable scientific graphics software, has enhanced the visualization capabilities in version 16 of their Surfer® gridding, contouring and 3D surface mapping package — geologists, environmental consultants, and geospatial professionals will find Surfer 16 makes it easier for them to interpret complex scientific data. Surfer is a robust 3D data visualization and mapping software that enables users to model their data sets, apply an array of advanced analytics tools and graphically communicate the results in ways anyone can understand. Known for fast and powerful contouring algorithms, Surfer is used extensively by geologists in mining and oil & gas activities and by hydrologists in environmental monitoring projects. Golden Software CEO Blakelee Mills said that the company has improved every aspect of core functionality in Surfer 16 so it’s faster and easier to make meaningful custom maps. Surfer users will find the new version generates more accurate representations of physical, chemical and structural properties, allowing them to make better decisions. The combination of Equal Area Stretch and Contouring creates striking visual maps that vividly highlight data distribution. This makes it easier to interpret and understand geophysical and geochemical concentrations in the subsurface. Surfer also has a reputation for high-quality graphic outputs, powerful gridding algorithms, and ease of use — and the company has improved each of these capabilities in Surfer 16.